Beneath the hood of Charlie's first Chevelle rests a small block Chevy engine pulled from a Revell 1965 Chevy Stepside Pickup kit. It is topped off with valve covers and an air cleaner taken from a Revell 1963 Impala kit. The distributor is from the Replica and Miniatures Company of Maryland and the spark plug wires are from Detail Master. Charlie fabricated the headers from solder and heat shrink tubing. On this build, he also created an oil dipstick from aluminum wire. 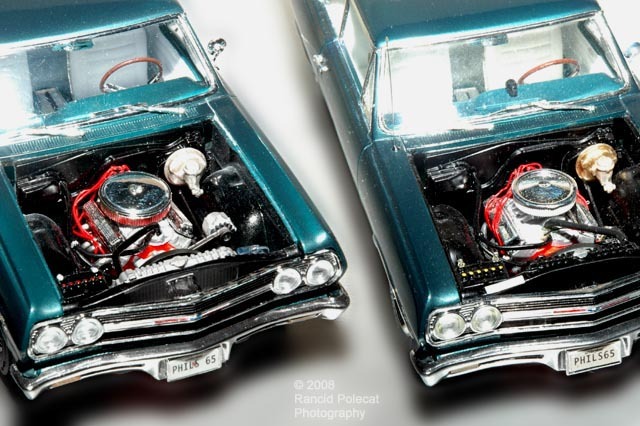 For the second build, Charlie installed a small block Chevy engine straight from his partsbox and detailed it with a Replica and Miniatures Company of Maryland distributor and Detail Master wiring. As with the other engine the headers for this one were also fabricated from solder and heat shrink tubing.